Developing suppleness in your horse is the result of systematic training which enhances the elasticity and power of the natural paces. 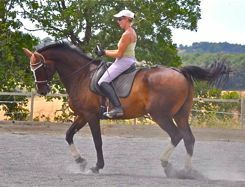 All horses have the potential to move in a beautiful supple way when training correctly. In our work with horses we have been more interested in the journey between A and B with any particular horse, than how much success we could achieve in terms of producing a result in competitions. This means that we are happy to work with any horse, whether difficult mentally or limited physically, spoiled or unspoiled. In this way we have learned the fundamentals which must be applied in every situation, as well as the fine-tuning necessary for each individual horse. 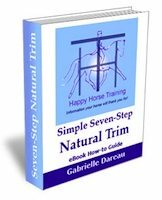 This fine-tuning is very important because each horse is very much an individual, and adapting your training method is as important as sticking to the fundamentals. However the fundamentals really do exist and they produce results, as we have seen time and time again. These photos show how any kind of horse - from warmblood to arab, thoroughbred to native - can acquire suppleness through correct training. What Does Enhancing Suppleness Mean? When something has more suppleness it means it can move in a more flexible way. When we systematically stretch and move our joints in a particular way, over time the muscles strengthen for both the stretch phase and the flexion phase. Different muscle groups are employed for each phase of a movement because an individual muscle has only one way of acting, that is to contract. This means that we have extensor muscles to allow us to stretch out our limb, and then flexor muscles to allow us to bend it. Not only do the muscles become stronger, the tendons which attach the muscles to the bone also become tougher and better attached. The intelligence of our body is responding to the physical demands we are making. If we are habitually stretching particular ligaments (ligaments attach bones to other bones), they will also respond to a certain degree, and lengthen or shorten as required. This is how we can form a correct leg as a rider (see Rider Biomechanics. This is a process which takes many, many years of consistent practice. A well as developing the musculoskeletal structure, we will also develop the central nervous system - what is often referred to as 'muscle memory'. This is the intelligence which operates the muscular activity. The nerves will memorize the physical postures and the movements you make when you ride, and allow you to become more efficient and quicker at finding the correct posture, and keeping it, and also responding to changing circumstance. This process of profound bio-structural adaptation to your role as a rider will happen in phases, and although the different physical processes happen in parallel, they will not necessarily always be in perfect harmony. Sometimes you may feel more supple, but less strong. Other times you might feel powerful but clumsy. Some parts of the rider's body will develop more quickly than others, and, during the process, some areas must be prioritized at the expense of others. 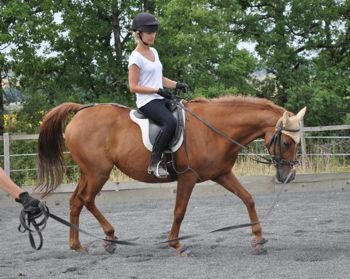 For example, the rider must put the development of their abdominal muscles before that of their leg muscles. This is because there is an order which must be adhered to in putting the whole mechanism of you and your horse together in engagement. If there is a secret to achieving this transformation towards suppleness, it is simply to stick with it. Don't give up, and in time parts of your body will stay in place for longer, your horse will balance better and become straighter. Problems will arise and be resolved. It is a project which will continue for the rest of your life and will gradually become more and more natural to you and your horse. The relationship that you form with your horse as a result will be priceless. 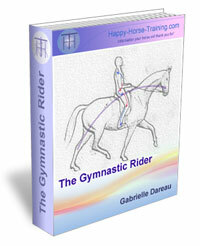 How Does Suppleness Manifest in You and Your Horse? Development of postural muscles which support the ring. You will see the line delineating the abdominal muscles along your horse's belly more clearly and more consistently. This applies (of course) to your own abdominal muscles! Don't expect a six-pack overnight, but you will strengthen them up considerably. While your abdominal muscles are contracting, you and your horse's back muscles are stretching, and the vertebrae are therefore arranging themselves in the healthiest way possible, opening out any compression and allowing the discs to fill with fluid properly. Both you and your horse might have existing spinal lesions which will be disturbed in this process. In this case it is usually necessary to seek the help of an alternative therapist to help resolve the blockages. If you carry on regardless, compensations can set themselves up, and these will cause stiffnesses which negate the work towards suppleness that you are trying to carry out. You can find more about this in Horse Healing. Correct development of neck muscles and hind-leg muscles. 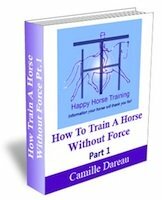 When a horse is moving either towards engagement (because he is not yet strong enough) or in engagement, he is building up all the muscles which support that. This is why quality is far more precious than quantity. Even two minutes of correct engagement work is worth more than hours of unengaged work. In fact work on the wrong muscles is fixing the horse deeper into the hollow posture, therefore the more training that is done like this, the worse it will get. Working towards engagement is often the first stage, but will still build the horse correctly. Quite often a horse is too weak to hold himself in the ring, but trying to hold him or place him there will only cause him to stiffen against the restraint and derail the development of suppleness. 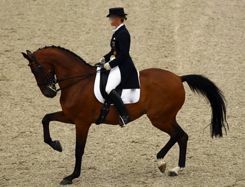 One of the objectives of real dressage is the suppling of the majority, if not all, of the joints of the horse's body. From the temporomandibular joint to the fetlock joints. While the horse's ability to hold himself up and propel himself forward improves, his joints are becoming flexible enough to receive and absorb this movement. This is what makes the paces of a gymnasticized horse so attractive. The movement is synchronized and this allows the paces to become more expansive and cadenced. Not to be confused with the gimpy jerking movement of a horse working in tension. 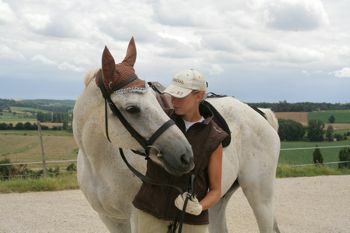 All of the outcomes above work together to strengthen the core structure of both you and your horse. This is the ultimate goal in the physical dimension of horse training. When the horse can develop enough evenness in his muscular power, and enough consistency in the suppleness of his joints through which to channel that power, then he transforms into a different animal altogether. You, as his rider, have also been developing your postural ability to stay straight and therefore keep your horse straight, and this strength will harness his strength, so together you move in powerful gymnastic harmony. The beauty of this engagement cannot be mistaken. There is something about it that looks right and feels right, and once you have felt it nothing else is enough. In these photos, the horse on the left is working in correct engagement - the means by which we achieve suppleness in riding, whereas the horse on the right is being forced, between spur and double bridle, into an artificial posture, resulting in tension and therefore stiffening of the joints. To an uneducated eye these two pictures could look quite similar, but they could not be more different in terms of the gymnastic dynamic that they portray. In terms of the effort, both mental and physical, required not only of you, but also of your horse, in order to achieve a single moment of perfect unity, there is no doubt that correct riding is one of the most difficult activities you can attempt. There are always a thousand ways to do it wrongly, but only one way to do it right. If it is viewed, however, as the challenge that it undoubtedly is, and taken seriously, it will give you some of the greatest moments of fulfillment that you will experience in your life. As well as your physical development, you will also develop your ability to concentrate and remain patient in trying circumstances. Don't let yourself fall prey to quick fixes and gadgets, they are only a means of distraction from the real work. Remember that the process of developing suppleness will be just as trying for your horse, maybe more so because he has to accept your judgment of every situation which arises, and no-one is right every time. But if allowed and encouraged to, horses can and do take their work extremely seriously, and derive the greatest pleasure from it. It can not only civilize them, but it can capture their imagination and expand their horizons way beyond the ordinary outlook of a horse.